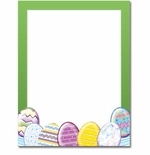 Our pre-printed and colorful Easter paper stocks are perfect for flyers, stationary, or party invites for Easter or other Spring themed events. Now creating a beautiful, colorful flyer, poster, invitation or announcement, for your party or special event, has never been easier. 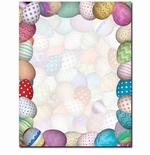 We also carry coordinating #10 envelopes in Easter colors and pastels, if you are planning on mailing your piece. And, when you purchase in larger quantities, you can save money with our bulk discount program! 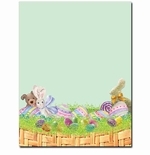 And, going hand-in-hand with our Easter paper products, you might be interested in our Spring Floral Paper Stock product line. 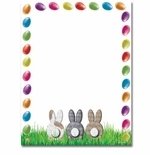 With beautiful full color paper frames featuring Easter themed icons such as baby chicks, Easter bunnies, Easter eggs, Easter lilies and more, no longer do you have to settle on dull single color flyers. Our paper is compatible with inkjet and laser printers, as well as copy machines. 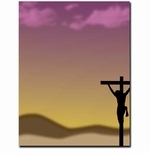 Simply design your flyer, invitation or announcement, using your computer and favorite software program, and print your finished piece on the full color paper stocks.